One-time owner of the Daily Telegraph, Jerusalem Post, Chicago Sun-Times, and approximately 200 other publications. Under scrutiny for receiving an apparent $7.2M in "unauthorized non-competition payments", Black resigned his position as CEO of Hollinger International on 17 November 2003 to attend to his legal troubles. The twin Barclay brothers David (parts hair on right) and Frederick (parts hair on left) purchased Black's stake in Hollinger for a reported $467M. 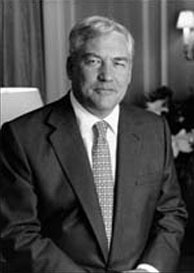 In 2007 Black was sentenced to six and a half years in prison for swindling Hollinger shareholders out of $6M, but was released early in July 2010 as a consequence of the US Supreme Court's paring down of "honest services fraud" law. Incarceration did not dampen his loquacity; Black continued to write a column for the National Post from FCI Coleman Low prison in Florida. Renounced Canadian citizenship to accept a peerage from Queen Elizabeth.